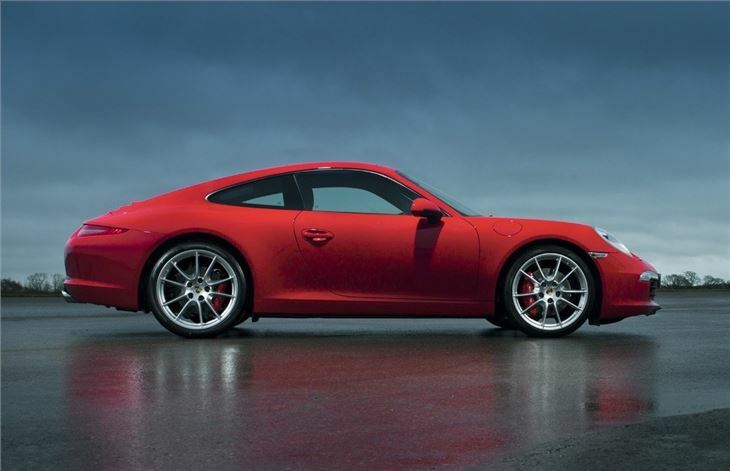 Despite being around since 1963, the shape of the famous Porsche 911 has changed very little. After all, why change a winning formula? 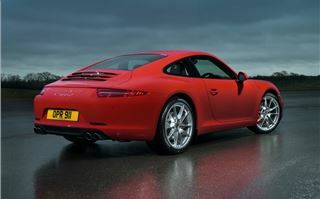 What's surprising is that after all these years there have actually only been three competely new 911 models. That includes the original version which was initially called the 901 but had its name changed after complaints from Peugeot which uses three digit names with a '0' in the middle. True fact. 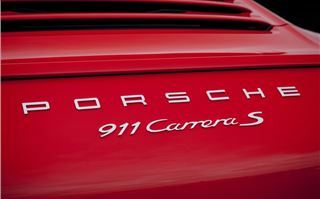 So the launch of the fourth new 911 model is an important milestone for Porsche. Classified as the 991, this model stays true to the classic Porsche design with the instantly recognisable profile, a flat-six 'boxer' engine and a rear-mounted engine. But there are some key difference. It's slightly longer than the outgoing model and has a larger wheelbase too. 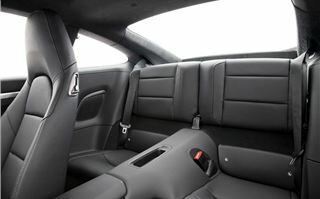 It's only extended by 100mm but this means more interior space plus improved stability. The roofline is slightly lower too and combined with some sleeker styling touches, such as the thin rear light clusters, it gives the 911 even more road presence than before. The bodyshell is new and around half of it is now aluminium to keep the weight down. It's also more rigid which helps handling plus it's better aerodynamically. 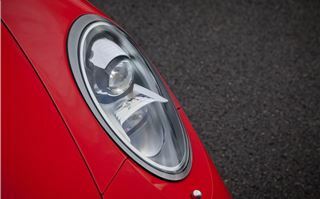 Even small details such as the door mirrors have been designed to minimise wind drag. As with the previous 911, this new version gets a spoiler that raises at speed, but now - for the first time - this actually creates downforce for the back wheels whereas previously it just reduced lift. 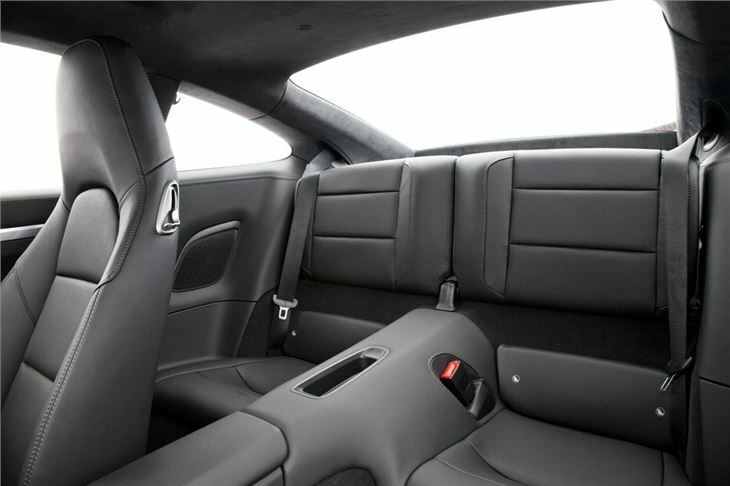 Inside it's all change too, with an interior similar to the Panamera. This means a high centre console that rises up to the dash and lots of switches. It can seem a little button-heavy, but once you know where everything is, it's often easier than a menu-based dial controlled system. 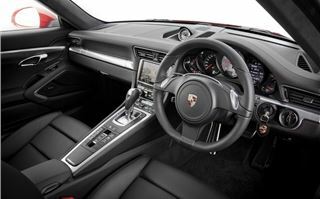 The 911 has also moved with the times and now has an electric handbrake plus there's also a touchscreen display and sat nav as standard. As you'd expect from Porsche, the quality is top notch. 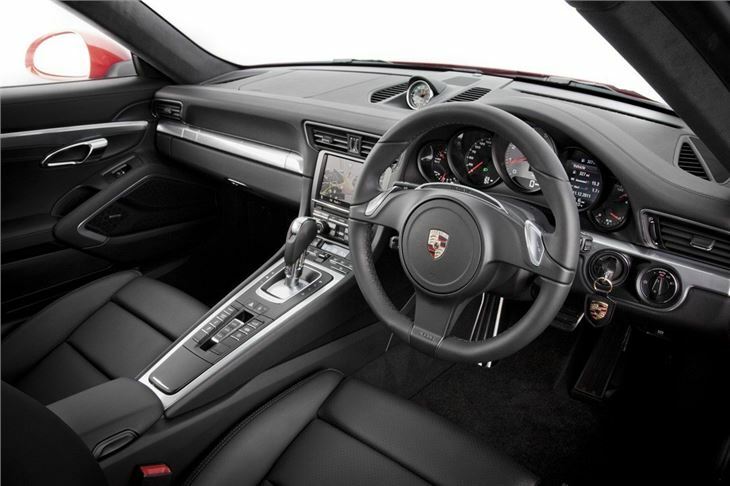 One of the best features taken from the Panamera is the addition of a high resolution multifunction screen in one of the five instrument cluster dials. You can have the trip computer info there but most usefully, sat nav information. However, the most notable changes come under the skin. 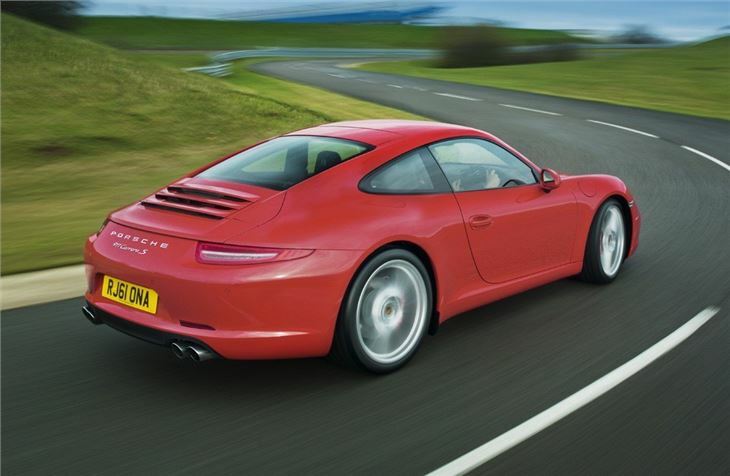 The standard Carrera actually gets a smaller engine that before with a 3.4-litre rather than 3.6-litre. It may sound like a backward step but it's actually the opposite. Thanks to some clever work with spanners by Porsche, power has increased over the outgoing engine with 350PS - an increase of 5PS. Torque stays the same at 390Nm. Performance is a smidge better with 0-62mph taking 4.8 seconds with the manual gearbox (it was 4.9 seconds before) but the big wins are in economy. 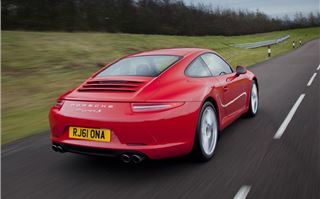 The Carrera now averages a claimed 31.4mpg with CO2 emissions of 212g/km. Mightily impressive for a car with 350PS. And it's a mightily impressive car to drive. Acceleration feels as rapid as the figures suggest and it sounds superb with that trademark Porsche noise reverberating behind you. While power peaks at almost 7500rpm, the good news is that you don't have to drive the 911 fast to enjoy it. It's incredibly civilised and as easy to drive at low speeds as an everyday hatchback. It rides amazingly well for a high performance sports car, the steering is nicely weighted but not too heavy and there's good all round visibility. And when you do want pace the 911 doesn't disappoint. The engine delivers all that power smoothly and there's so much torque in reserve, it pretty much never runs out of power. It's a real delight to drive and has impressive grip, even in the wet, giving you plenty of confidence when accelerating out of corners. 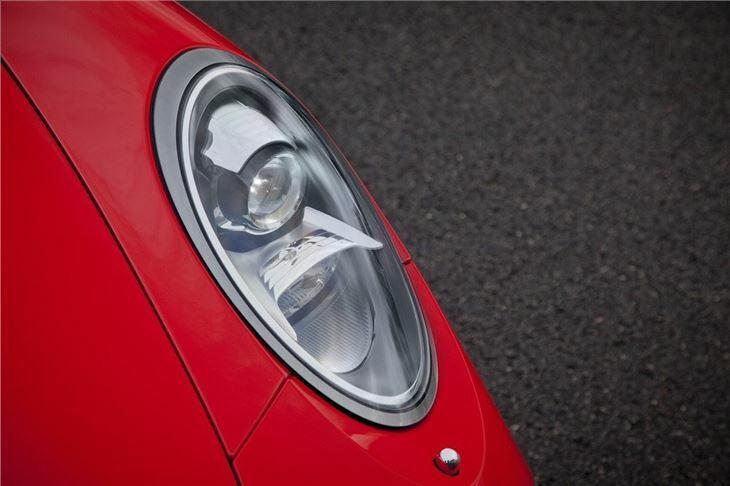 It's immense when it comes to stopping too thanks to an uprated braking system taken from the previous 911 Turbo. 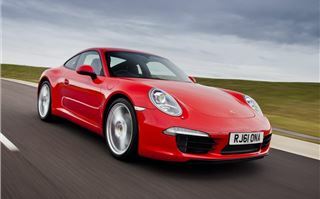 When it comes to gearboxes Porsche has taken a big step forward. 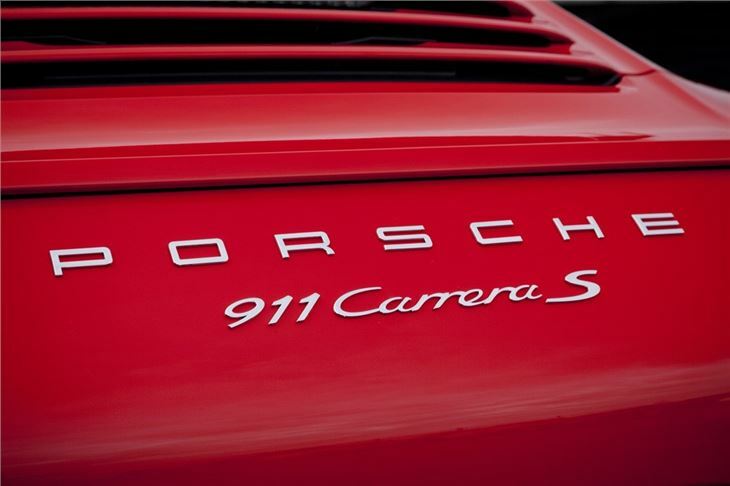 Because the 911 features the first ever seven-speed gearbox. That's not a typo - it does have seven speeds. Admittedly it takes some getting used to at first but basically seventh is just an overdrive gear so you can save it for steady cruising on the motorway. The changes are as positive and slick as you'd expect but surprisingly Porsche expects three quarters of 911 buyers to shun the manual and instead choose the automatic PDK gearbox. 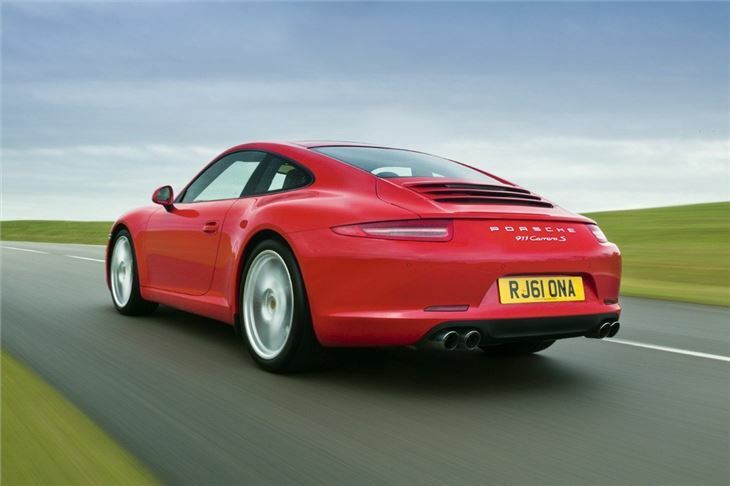 The PDK has had a mixed reception since it was introduced in the Porsche range. 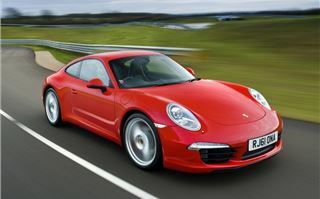 The double-clutch system seems suited to the likes of the Cayenne and Panamera but traditional 911 fans aren't as keen. 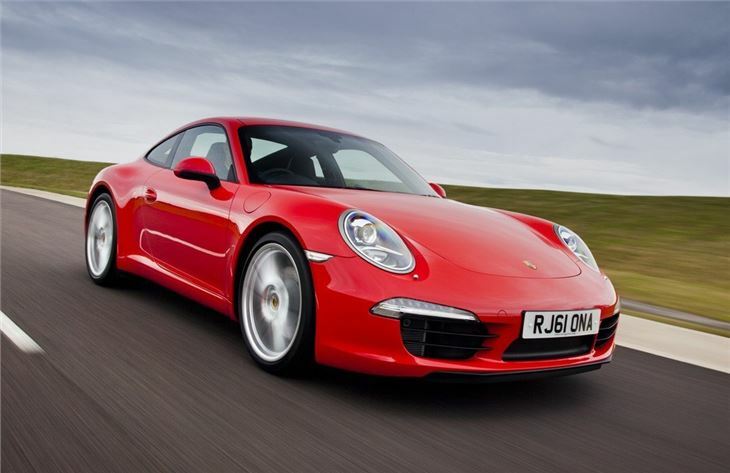 Porsche has taken 'feedback' on board and improved the seven-speed PDK for the new 911. It's now faster with more positive shifts plus, like the manual gearbox, it features an automatic start/stop system and a coasting function to help with efficiency. This decouples the engine when you're not on the throttle to save fuel. Whether you'd choose it over the manual is all about personal preference, but it is certainly better than the orginal system and doesn't detract from the enjoyment of driving the 911. For our money we'd stick with the standard gearbox, merely for the involvement factor you get, but if you sit in lots of traffic, then the PDK is a good choice. It also improves economy, with an average figure of 34.4mpg and emissions just 194g/km - amazing given the power it has. The other big change in the 911 is the introduction of a new electro-mechanical steering system. Now usually when we hear those words it fills us with plenty of apprehension as it often means steering that's very artificial. Well the good news is that's not the case with the new Porsche system. It's as responsive as ever with plenty of feedback and natural feel. Phew. Alongside the standard Carrera there's the more powerful Carrera S. It's about £10,000 more and comes with a 3.8-litre engine with 400PS (the old model has 385PS) with 440Nm of torque. Specify it with the PDK gearbox and the optional Sport Chrono Pack which includes launch control, and it will do 0-62mph in just 4.1 seconds. Yet economy is still 32.5mpg (29.7mpg with the manual gearbox). There are of course plenty of options available on the 911, but one worth mentioning is the Porsche Dynamic Chassis Control (or PDCC for short). This is an active roll stabilisation system which is available for the first time on the Carrera S. It's all very complicated but basically it reduces body roll when cornering which makes it even easier to drive quickly through bends. The new 911 Coupe is on sale now with the Cabriolet version being launched in March. 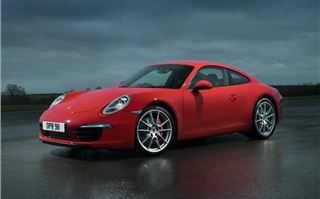 The current Carrera 4, Carrera 4 S, GTS and Turbo models remain on sale in 2012.